The Trumpet, Virtual trumpet from Sample Modeling. Format is Kontakt 2 Player, standalone, or you can load it in Kontakt 3. The samples are multi-sampled and looped. Sounds are realistic and great quality. Yes, they're varied enough, you get completely different instruments - three Bb trumpets, piccolo trumpet, German trumpet, and cornet. Mutes are available for the Bb trumpets. &quot;The Trumpet&quot; is the first of a line of new products from Sample Modeling, a company founded by programmer/musicians who were involved with Garritan, and specifically, the Stradivari Violin and Gofriller Cello, two Garritan products that have been discontinued. Like the Garritan products, &quot;The Trumpet&quot; is a product designed for keyboard players with a fair degree of keyboard skills and a knowledge of brass behaviors. I'll say up-front that when I first launched &quot;The Trumpet&quot;, after installation, I hit a note on my keyboard and was immediately inclined to dismiss it as a bad product. That's because &quot;the Trumpet&quot; really relies on expression and controller data to work. I can't emphasize this enough. Once you get used to using pedals and controllers to &quot;play&quot; The Trumpet, the beauty of this product becomes apparent. Installation is relatively easy. The installer asks you where you want to put the sample data, which is around 308 MB. It needs to go into its own folders (which you need to create first BEFORE you run the installer). As with most sample-based VI's, it's a good idea to put the sample folder on a different dedicated drive, in other words, not your &quot;C&quot; drive if you are on a PC. On your &quot;C&quot; drive you need to create a folder called &quot;Sample Modeling&quot;, or &quot;The Trumpet&quot; or something easy to identify, this is where the documentation will go. The actual Kontakt 2 player should be installed to your &quot;Native Instruments&quot; folder. A word of caution, the Kontakt 2 player that the installer places on your drive is the one that the Trumpet is associated with. For some weird reason, after installation I launched V-Stack on my PC, and selected &quot;Kontakt 2 player&quot;, but I couldn't access &quot;The Trumpet&quot; from there. I had to launch Kontakt 2 Player in standalone mode. Also, I have Kontakt 2.2.41, not Kontakt 3, and my version of Kontakt will not load any instances of the Trumpet, which it identifies as Kontakt 3 instruments (even though there is a separate &quot;Kontakt 3&quot; instrument folder). I think this is a bug, I have to contact Sample Modeling about it. the first thing I was presented with was a GUI with a &quot;Warning, no CC11 received. The instrument will not work properly&quot;. I had to make sure MIDI in and out was enabled in K2 Player, that audio in and out was routed properly, and then I had to press down on the expression pedal connected to my MIDI keyboard controller. This &quot;activates&quot; The Trumpet. The next confusing thing, and maybe the most confusing thing initially, is that amplitude of the Trumpet is controlled by CC11 from your expression pedal, NOT via velocity on your MIDI keyboard. So if you have your expression pedal all the way forward and just hit a note on your keyboard, the sound is full &quot;ff&quot; and very bright and piercing, with no dynamics. This led me to initially conclude that I'd wasted my money on yet another set of static and lame samples. As soon as I moved my expression pedal down, I realized how &quot;volume&quot; control works - it's all determined by where you move your expression pedal. At midway of your pedal travel, for example, the sound is &quot;mf&quot;. At pedal position of all the way back it is &quot;p&quot; and all the way forward it is &quot;ff&quot;. The amplitude and the timbre change smoothly from &quot;p&quot; to &quot;ff&quot; - and by that I mean completely smooth transition. Crescendos and descendos sound brilliant and very realistic. I haven't encountered any other brass VI's that work this way, or this well. Keyboard velocity affects a number of things - note-on attacks, primarily. But it also controls a wide variety of other behaviors. Since &quot;The Trumpet&quot; is monophonic, playing one note and then another interval above or below it while holding the first note creates a portamento, and the speed of the portamento is based on how hard you hit the next note. If you hit it softly the speed is slow, and faster if you hit the note hard. Keep in mind that amplitude is always controlled by the expression pedal, so you can be hitting notes softly but still have a loud, bright sound, if your pedal is forward. This takes some getting used to, as we keyboardists are accustomed to notes getting louder whedn we strike the keys harder. With practice, I was able to get really cool slurs, both upward and downward, which sound totally convincing. Trills are accomplished by holding a note and then rapidly triggering additional notes in succession, just like on a monophonic lead synthesizer such as a Minimoog. Since it's a fine line between what you'd call a shake and a trill, you can also do shakes this way. I suppose one person's shake is another person's trill, it depends on your intervals played and the speed between them. The keyswitches are located from C1 to E2 on your MIDI keyboard, and they control a number of things. A drop down menu in the GUI indicates which ones control what, but a better guide to their function is in the manual, which is well-written. My favorite keyswitch functions are on F1 and F#1 - play a note, and then just before releasing it, hit either one of these keyswitches, and you get a little end-of-note shake, which is so typical of trumpet players. A#1 activates the plunger mute, IF you've selected one of the three trumpets that have mute capability (the drop-down menu button on the lower right of the GUI will include &quot;mutes&quot; in the list if you've selected an instrument that has mutes). The cornet and the piccolo trumpet don't have mutes. If, on a muted trumpet, you press A#1, and then move your expression pedal up and down, you get the plunger or &quot;wah-wah&quot; effect. The other mute options are straight, cup, bucket, harmon, and a harmon-straight combination, and they're all very good. Pressing &quot;B1&quot; on your keyboard while playing a note results in a fall. The harder you hit B1, the faster the fall. This works really well. One note on the fall - it is a succession of notes, not a single sample of a performed fall. I see why Sample Modeling did this - sampled falls only work at one tempo, which is the one they were recorded at. The way falls work in The Trumpet, it tends to sound like a slide downward on the notes of a keyboard, which results in a detectable disconnection of the notes. Something like Yamaha's VL technology models falls really well, better than The Trumpet does, but in every other area of realism The Trumpet sounds more realistic than VL. The Mod Wheel controls vibrato and as you push it forward, the vibrato becomes a shake. A big word of caution, and my one big complaint with The Trumpet, is that if you push the mod wheel all the way forward and leave it there, the sound disintegrates into a glitchy mess. You have to move the mod wheel forward and back rapidly to achieve shakes, never leave it all the way forward. A similar thing happens if you rapidly moved the expression pedal back and forth (&quot;nervous foot&quot;, in other words). The sampling engine can't handle really rapid back and forth pedalling, the sound just gets glitchy and broken up. I found that it was more effective to create my own vibrato with deft use of the pitch bend wheel (something the manual encourages, by the way). Once I got familiar with the ovderall behavior of the Trumpet, using the expression pedal, controller wheels, velocity, and the keyswitches, I realized what an awesome product it is. Unlike workstation brass or even a lot other sampled brass VI's, it is not an &quot;instant gratification&quot; instrument - you have to animate it and use the controllers, and as I said before, you need to be a pretty decent keyboard player who is familiar with trumpet behavior. &quot;The Trumpet&quot; is a VI that needs to be &quot;learned&quot; and takes some practice. The better you get at controlling it, the more realistic your trumpet parts will be. 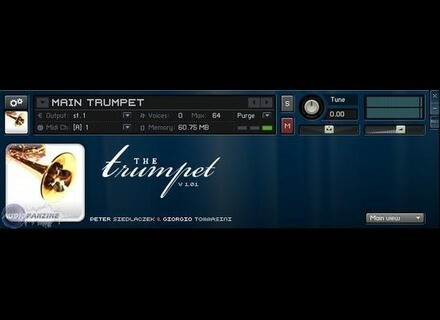 The sound itself is gorgeous, and combined with proper use of the controllers, &quot;The Trumpet&quot; is in my opinion the holy grail of sampled brass VI's. Sample Modeling is rumored to be working on other instruments (the trombone would be my next choice), and I can't wait to see and hear what they next come up with. I am under macpro octo. You can imagine that it is running.